Browns have been producing quality Farm Fresh Traditional Turkeys at Stagsden for over 60 years. In that time we have concentrated on providing a personal service to our customers, many of whose families have been buying turkeys from us since the beginning. Reared traditionally, using home grown, Quality Assured grain we produce succulent, full flavoured broad-breasted turkeys that bring our customers back year after year. Whole turkeys, crowns and stuffed breasts available to suit any sized family. Also, watch out for our home made turkey sausages, burgers and kebabs. 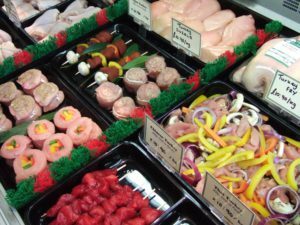 Fresh Free Range Whole Chickens and Chicken Portions are supplied by A.G.Murdoch & Sons, based at Cardington, Beds, another local family enterprise with traditional farming values. The chickens live in specially designed small houses which reduce problems associated with hygiene and pecking order behaviours. Fresh chicken breasts, drumsticks and St George’s Freedom Food whole chickens are supplied by J.W.Diaper & Sons, a long established family firm based in Suffolk which has an enviable reputation for supplying quality fresh chicken. The firm received many awards recognising the high quality of its products during the 1990’s, and were the outright winners of the 1998 ‘National Quality Chicken Awards’, the last year that this prestigious award was made. Browns Farm Fresh Traditional Turkey Not just beautiful – SIMPLY THE BEST! Enjoy our turkey all year round. 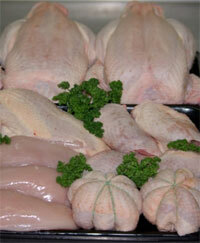 Turkey breast fillets, rolled joints and BarBQ cuts available throughout the year.